Prepare to have your Bine Bent! It’s all about the beer! To brew awesome beer you have to take a few things into consideration. Beer is made from Malted Barley, Water, Hops and Yeast. Although today other adjuncts are used to express new flavors and aromas typically not possible with the main 4 ingredients afore mentioned. Most beer recipes start with a traditionally recognized profile for the particular style of beer being made. This is fine for some folks but a growing number of us, while still appreciating the traditional, feel this is just a starting point. We must push a boundary and bring out an attitude of the beers style that we feel needs more recognition. So we BEND the recipe to our taste. This is partially what BENT stands for in our name. BINE is to a Hop as Vine is to a Grape. BINE is what the hops grow on, the part of the plant that climbs, twists and BENDS as it attaches itself to whatever is available on it’s ascent to the boil kettle. Thank you BINE! We'll keep you informed about news, events and special offers. Bavarian style Hefeweizen. The perfect beer to enjoy while doing your favorite outdoor activity. Features German Hallertauer and American Citra hops. American Pale Ale style. Put on your new "Vines" and come out to drink this sweet pale with a kick. Featuring Simcoe and Cascade Hops. The classic IPA with our own twist. Extra long boil of Amarillo, Simcoe and Citra takes advantage of the bittering quality of the hops. Inspired by a trip to Scotland. Simcoe hops throughout. Features Peated and Maris Otter Malt, resulting in a light smokey aroma..
UK all the way. Dry biscuit flavor with a hint of coffee and chocolate. Features Saaz, Chinook and Cascade hops. A fruit forward IPA. Dry hopped with mass quantities of Citra hops to bring out the tropical characteristic. What do you get when you take two brothers from Wisconsin, (who's youth was to go to church and then to the local tavern with the family for Shlitz, Pabst or Old Milwaukee), and relocate them to Washington State where the best hops in the world are grown? 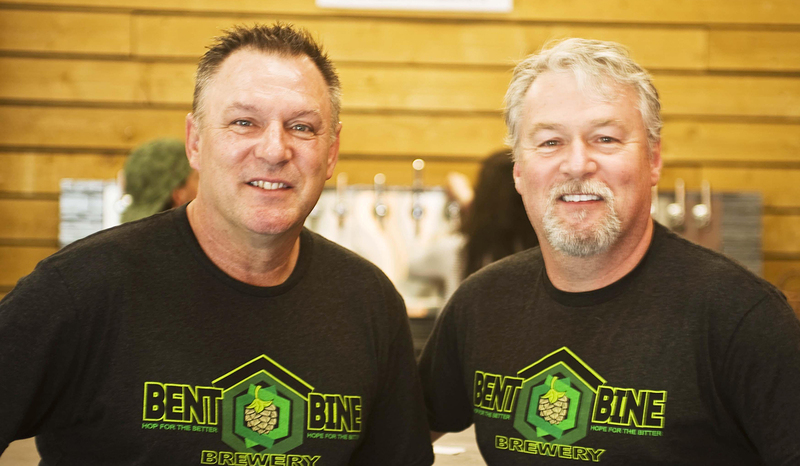 Tim and Todd Masbruch, owners and founders of Bent Bine Brew Co. in Belfair, Washington wanted to re-create those Wisconsin family values of cheerful community connection and the family tradition they grew up with here in beautiful Mason County. This is what they love; connecting with people, bonding over beer, chewing the cud! (Yes, lot's of cows in Wisconsin)! It's in their blood and it's in their family and this is what they are best at! Join Us At Bent Bine Brew Co.
We are a family-owned brewery located in Belfair, Washington State. Nestled between the North Bay of the Puget Sound and the southern hook of the Hoods Canal. The brewery at Bent Bine Brew Co. was developed to provide a relaxing environment to enjoy fresh craft brewed beers in our community with locals, friends and visitors to the region. The "scene" is warm industrial with steel, glass and concrete materials that come together into a surprisingly comfortable and inviting area to share conversations, experiences and of course our hand crafted brews. We brew our beers in relatively small craft batches that cause a moment of reflection and consideration in the individual enjoying our craft work. Join us for all of the seasons of refreshment and enjoy our dream as you live yours. Please complete this request form.